My newest eCig mod setup had arrived in the mail and was waiting for me when I got to the office yesterday. It's an eVic vaporizor and a Protank 2 clearomizer. 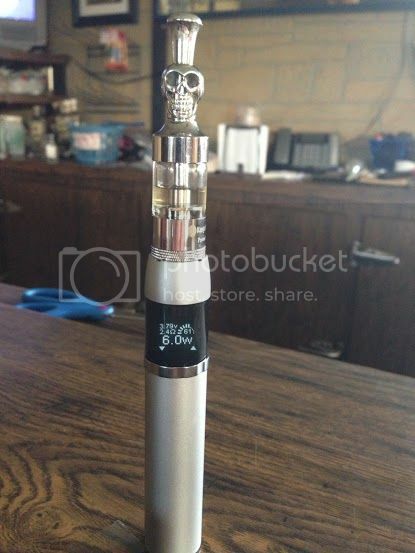 I already had the skull drip tip. The eVic is quite the nice mod, pretty high tech. It has a usb port for charging as well as connecting it to the computer to upload/download data and settings to and from the device as well as upgrading the firmware as updates are released to add features and fix any bugs (of which I haven't yet found any). It's also surprisingly light weight compared to my other mods. The eVic came with a Samsung 2600ma/h 18650 battery, which should last at least a couple of days of vaping on a charge. I'll be ordering another battery soon to have a back up. I love the fact that the device can charge the battery directly via usb connection. My other mod that uses the 18650 battery can't do that and I've had to use a 110V battery charger for those, which can be problematic in a truck if my APU dies. I have plenty of usb connections in the truck so this is a great way to go. The combination works very well and this is now my favorite setup. I'll be ordering another Protank 2 in the near future as it produces good, flavorful vapor at only 6 watts. That a couple of watts lower than any of my other clearomizers, which means a battery charge will last a lot longer. For me, this is the best alternative to smoking I have found to date.